or your school doesn’t pay! Our counselor has indicated that she has already been able to use the message you presented to the students about bullying. She feels it is one of the few times the connection was made in their minds as to how their behavior affects others. In this anti-bullying school assembly program, James addresses the various types of bullying, why kids bully, and ways for students to deal with bullies. He stresses that “telling is not tattling.” Students need to recognize that informing the teacher or other adult about bullying behavior is not “tattling,” but a crucial intervention to help someone. This school assembly also addresses the role of peer-pressure in bullying behaviors, since so often it is a group of kids abusing a single individual. James encourages students to be willing to stand up to the group, or at least walk away, and not be led into bullying behaviors by their friends. In middle and high school life, peer groups rule. The most important decision a young person makes is the choice of role models. This is the question James asks throughout this challenging and powerful peer-pressure school assembly program. James uses his magic to demonstrate the power of influence, and challenge students to hang with people who really care, and who are positive role models. Will cigarettes make you cool, attractive, macho, healthy, or mature? In his anti-smoking school assembly program, James’ magic demonstrates for students that such promises are nothing but smoke and mirrors. James exposes how tobacco advertisements are similar to magicians’ tricks, but with a different purpose: to hook you on a drug called nicotine. Rewards Assembly: Just for fun! Want to reward your students for good attendance? Good grades? Fundraising efforts? Outstanding leadership? What better reward than a magic show school assembly! No message, just loads of fun! James Warren performed every year for over 13 years at the famous Magic Castle in Hollywood, California. His magic has astonished stars like Michelle Pfeiffer, Goldie Hawn, Sinbad, and Warren Beatty. Most of James’ routines use lots of audience participation to involve the students on stage in situations guaranteed to create loads of fun and excitment! Watch more videos to see what parents, educators, and counselors are saying about James Warren’s Magic With A Message school assembly programs. Middle School Enrichment Program Testimonials! I could see in the faces of our students they truly loved your show. The ultimate compliment was from my colleagues after the show. Many said it was the best program we’ve had in some time. Others thanked me for such a powerful performance. I have heard wonderful things about your performance here last week. Thanks for sharing your wonders with the McCombs students and staff. James, your anti-smoking presentation for our high school students was superb. Your held their attention, delivered the message, and entertained them at the same time. Well done! One of the best assemblies we’ve ever had at Hillview, and a great beginning for our Red Ribbon Week. This was one of the few assemblies faculty did not mind giving up their class time for. I have recommended your assembly to the California League of Middle Schools. James is a dream to work with, and puts on an excellent assembly with powerful messages that really land with the kids. The kids were totally engaged and very responsive. I’ve been told numerous times that this was the best anti-bullying assembly we’ve had, so that says a lot about your message and performance. I will gladly recommend you and look forward to working with you in the future. I want to thank you for the wonderful show you put on. Everyone was very happy. When I was leaving the gym after the assembly, I was walking downstairs, and there were several students talking. I heard a lot of positive comments, but even better, I heard them talking about good choices. Can’t ask for more than that! Thank you for coming out to our after-prom party. You left everyone mindblown! I wanted to write to thank you for the wonderful assembly that you did for us! The staff and students were very impressed with the way you taught invaluable lessons about bullying. You were very entertaining and at the same time made a big impact on how our students think about bullying. James, you totally exceeded all our expectations with your keynote presentation for our youth anti-smoking summit. Thanks for coming all the way to the state of Washington! Your talents with students are very special and should be experienced by all young adults. Your assemblies for ten of our middle schools throughout the District were outstanding. Not only was it well received by the students, but was hailed by faculty and staff. I would like to personally thank you for the wonderful program you gave us today. It fit perfectly with the message we have been trying to send with our no name calling day. I can�t tell you how happy I was, not only with the success of our day, but the fact that our students were absolutely mesmerized by your magic. Thank you so much for helping me to make our day a good one! I’ve been booking assemblies for our schools for 13 years, and your show was great. I invited some parents to the assembly since the PTO paid for this, and they loved the show. Teachers and students were coming up to me after you left telling me how fabulous the assembly was. Thanks! Students and staff are still talking about the show and using your message to spark discussions about anti-bullying, and how we can become a society of up-standers. It really engaged the students, and we would love to have you back. Thanks again for a great show! Your assembly definitely made the impact we hoped it would. You really held their attention and the high school kids were right with you. Fantastic assembly! Thank you so much for the presentation you gave to our students at Willow Grove Middle School yesterday for Red Ribbon Week. It was truly magical. The students thoroughly eOhiooyed it. They took the message you gave and it gave them a new energy and enthusiasm as we celebrate being drug free. Thank you so much for bringing such an insightful and entertaining show to our middle school students. Feedback from our students has been nothing but positive about you and your presentation/magic. I think that all of us, students and adults, learned some very important facts and ideas about substance abuse and influence. Thanks again for doing a great job. The feed-back from the students has been very positive and they really eOhiooyed your show. You held their interest! Your message confirmed what we are trying to teach our students about bullying, and your combining it with magic really got their attention. Everyone loved the assembly. Just wanted to drop a note saying the students loved your show. I heard nothing but great reviews! That was a wonderful assembly. Thank you so much for the amazing and entertaining performances you put on in Addison, New York! Everyone really eOhiooyed themselves and your message was a huge help to the work Reality Check is trying to do in Steuben County. It was an assembly I am sure the youth will not soon forget. The Capital Region B.O.C.E.S. would like to send 1,000 thank you’s. We loved your presentation. It was amazing. Come back soon! We would like to express our extreme gratitude for your willingness to attend our PEACE day. Your program was a huge success and our whole school was impressed beyond words! We appreciate all that you did and look forward to working with you in the future. Thanks again! Exactly what we needed for our “BUSTED” youth conference: both entertaining, and yet the anti-smoking message came across very clearly and strongly. Great job. Thanks for a great assembly. I spoke with several people, and all four assemblies were well received. Great show. The students loved it! Thank you again for your informing and entertaining presentation on Saturday. We all loved it. I really eOhiooyed your technique of captivating middle school students with magic and then delivering the no-smoking message through advertisements. Thank you. It is quite a talent to be able to command the full attention of 400 people and you do it so well! My favorite part is when the kids just start yelling, “no way!” It’s awesome. Thanks again for a great performance. You really ended the day on such a great note! Not only did Mr. Warren capture the attention of the students, but also our faculty and parents in the audience. His magic had us mesmerized, and the messages and personal stories that went along with them were authentic and meaningful to our students. I would highly recommend hiring James Warren to perform for your students! Hello! Thanks so much for two terrific assemblies! I would have expected/hoped for after researching you that you would give an “A” performance, yet you gave us an “A+”!!! The feedback from the kids was great. They especially loved the expanding and shrinking head. The subject was presented in such a way that will stay with the kids. Great job! The students loved it. James, what a wonderful assembly for students to experience while learning about one of life’s true killers. It’s great when we can learn valuable content while being entertained. Our school applauds this show! James is a terrific performer, who not only captivates his audience, but motivates and teaches them as well. As a high school pyschology instructor and therapist for the past 25 years, I want you to know how impressed I was with your performance. You communicate positive messages about identity, self-esteem and self-image. I’m sure they will not soon forget your assembly or the messges you communicated. What you do is truly of benefit to our youth and I hope that at sometime in the future you will come back again. Our students talked about your assembly for days after your visit to our school. The general consensus was that they loved the magic and the humor and even remembered the messages. Our faculty, staff, and parents highly recommend your performance to other schools. It was an excellent assembly. Not only was it very professional, it was also very informative. It covered many important topics, giving us a great opportunity to discuss these issues with our students. I received many notes from teachers saying how much the students eOhiooyed your performance. It is difficult finding good motivational speakers for middle school students; but your performance was one of the best we have had in the past five years. Not only did our students thoroughly eOhiooy him, but our teachers gave James rave reviews. Our students were captivated and enlightened by James’ message, and it is definitely one which they should hear. I just wanted to thank you again for coming to our school on Thursday. Our students had so much fun and they are still talking about it. Your message was great and I was especially impressed that you talked about gangs since it is such a pertinent issue, even with our middle school students. You really did an amazing job and we will likely be contacting next school year for another assembly. Thank you again for captivating our students (and staff) and giving them a great time! I heard great feedback from the kids. They eOhiooyed the show and felt the message was valuable. Thank you for two terrific performances! The students were amazed with the magic, and your anti-bullying message was on point for both age groups. Wonderful job using the magic to capture their attention, and getting your message across. Very impressive, and much needed at our school. That was awesome! You had those kids riveted. We’re definitely having you back. Until your presentation, I had never seen my classmates as engaged in an assembly program. You obviously have that special factor that helped get the message of the harm of tobacco across to the close to 3,000 students you performed for at our two schools. Ever since Friday I have not been able to walk through the halls without being stopped by a teacher or fellow student telling me how great the assembly was! I cannot thank you enough for the steller performance you did for our after-prom party. The messages you intertwined about good decisions, actions, and consequences were awesome. I had a phone call from a parent at home last night, and her son was STILL talking about it! Thanks for making the rounds to all our County schools, James, and helping to educate our students about the dangers of smoking. On behalf of the students of La Jolla High, we want to thank you for your marvelous performance. The senior class, as well as the administration, appreciated your presentation. Thanks for coming! Highland Park High School would like to thank James for a fantastic performance! The students and staff were absolutely blown away! You gave us the perfect ending for our Wellness Day, with some entertainment and laughter. The kids loved the assemblies! They said you were one of the highlights of the day. Thanks for coming to our school. I wasn’t sure how magic and the serious message of anti-bullying becomes a successful assembly. I was blown away! If you decide upon a different profession, I suggest you become a teacher. You obviously know how to communicate to any age. The students liked how you integrated the tricks with lessons about bullying. They were also touched by your college story. I will indeed have you come to our school again. We had wonderful feedback from our students! The kids loved that it was fun and taught them something too. I have even had students refer to the assembly when working out an issue in my office. We will definitely be in touch to do this again! Thank you so very much for the great presentation this morning. It was a perfect way to start the school year, and I know the students were really listening. Having the whole middle school attend helped us all get on the same page, and be able to help our students in new ways. From the opening moment, James Warren had our students hooked and thus proceeded to hold them spellbound for 45 minutes. What an entertainer! Thank you for performing for us; the kids wrote rave reviews about you on their evaluation forms. I got to see your act and it was a perfect combination of art, education, and fun! What an act it was! Students and staff alike were absolutely enthralled from start to finish. Several parents I saw over the weekend said their kids could not stop talking about “the magic guy” they had seen at school. EVERYONE left the assembly with positive energy! Our staff and students loved you! Great message! Maybe we can have you again next year for a different topic. I really want to extend my many thanks to you for your work today. I have heard nothing but positive reviews from the kids and staff who were able to partake in the assembly. I wish you the best in your future work and look forward to someday being to bring you back to share your message. Excellent program on bullying! I’d like to have you back next year and make this a yearly tradition for our school. The bar has been set very high by engaging presenters like you, James. We certainly hope to have you back again for this event! I’ve been getting great feedback already! Everybody loved the assembly — we’ll have to get you back again next year. The feedback that we got was fantastic, and hopefully we’ll be able to invite you back again next year! Your energy was great, your message was great, and it was just what we wanted to tell the kids about peer-pressure. Everyone loved the assembly! I just got your evaluations. You got mostly 5’s which is the highest rating you can get. The teachers really seemed to eOhiooy your performance and thought it was very age appropriate and innovative for bullying and character education. Thank you for everything. The youth had very positive feedback about your presentation. James, your work was wonderful and well received in Addison. I have received positive feedback from administrators who were present. Please feel free to use me or “us” as a reference for any future programming in this area that might come your way. Best wishes and thanks again. The kids loved you and said you were “cool.” You were a big hit! Thank you so much for coming, and I hope you eOhiooyed New Mexico. Excellent program, James. Everyone was spellbound, and the message came across loud and strong. Thanks much! out the program. Based upon the performance I saw, I would be happy to recommend you to any of the schools in our area. It was a pleasure to have you perform at the middle school. The students’ reactions were nothing but positive. Best of luck in the future. Just wanted to let you know that we really eOhiooyed your show. The students as well as the faculty were very impressed. The assembly was so effective, and your message of “don’t be deceived by alcohol and tobacco ads” was carried out throughout Red Ribbon Week. The presentation was a perfect balance of entertainment and serious thought provoking material. James, you were a pleasure to work with and your assembly is definitely one which we look forward to rescheduling in the near future. Our students were in awe throughout the assembly. Mr. Warren captivated the audience with his magic and used student participation. Students left the assembly with a lasting impression of how the media has been used to encourage smoking. It was exciting to hear students share their feelings of why they had considered smoking, but now have had a change of mind. You not only held their attention, but delivered an important anti-drug/tobacco message. After the assemblies, students were able to tell me what you said about smoking and drugs as well as what magic tricks you performed. You gave a really excellent program for our high school students, James: please feel free to use my name as a reference. Fantastic job, James. Four programs in a row on the same day and yet you held the attention of the students in every assembly. James Warren was the ideal school activity after a week of STAR testing! Kids and teachers alike were riveted by his magic: he had 350 students laughing hard. Additionally, Jim was able to weave in messages about the benefits of teamwork and not giving in to peer pressure as part of his magic act. I would definitely recommend him to other principals and schools. Everyone is talking about how great your presentation was! On behalf of Pacifica High School, I would like to thank you for your wonderful presentation on peer pressure. It is a challenge to explain the ramifications of peer pressure and you did just that in a way that captivated the students and brought forth their full attention. Your performance was the talk of the campus. The best closing presenter we’ve had at the Texas Teen Tobacco Summit in six years! What you did was just perfect for illustrating the illusions of tobacco advertising. It is my pleasure to recommend to you, Mr. James Warren. 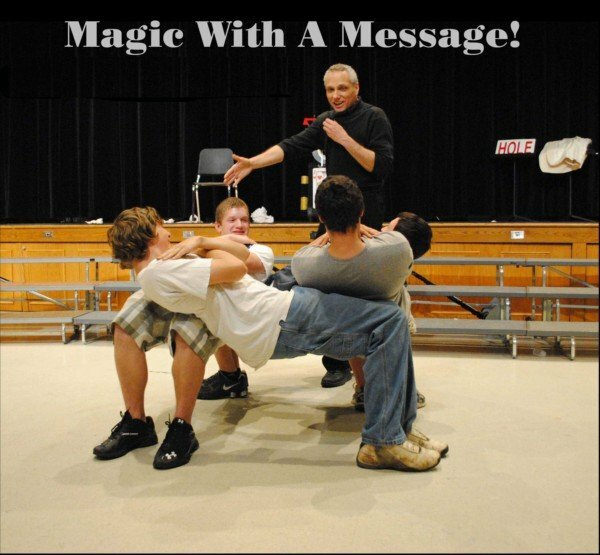 His message was integrated into a very entertaining magic show to which students responded enthusiastically. I would heartily recommend Mr. Warren for a motivational assembly speaker. Your magic was terrific and mind stumping! All 900 students were interested and amazed. The combination of the magic and the message was wonderful! Your tobacco prevention magic show is a great way to send a message to students. The feedback from the students and school staff at all four junior high schools has been positive. Thank you for sharing the message with Santa Clarita youth and being a part of the Santa Clarita Smokeout. I am a tutor at Southwest Jr. High and was lucky enough to be on the campus the day you were there. Everyone just loved your tricks, and I couldn’t stop laughing during the toilet paper routine. I really think your message got out to students. Thank you for this wonderful deed you are providing to America’s youth. He is charismatic and readily captures the hearts of kids. His message regarding smoking had the student body absolutely spellbound. He is definitely an “Earl Reum” 10. I have had the pleasure of seeing you put on assemblies for Middle School Students on two occasions. Both times the programs were top notch and informative. I would love to book you for our elementary school. Thank you so much for a great keynote presentation. The students and other conference attendees thought it was phenomenal! YOU can share the magic of James Warren with your staff, employees, and management. Call now: 607-301-0009, or click here to send James an email. Do it today to reserve your date!